Hey guys! It’s Kari from Life PreKARIous. 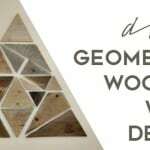 This geometric wooden wall decor project is one of my favorites! 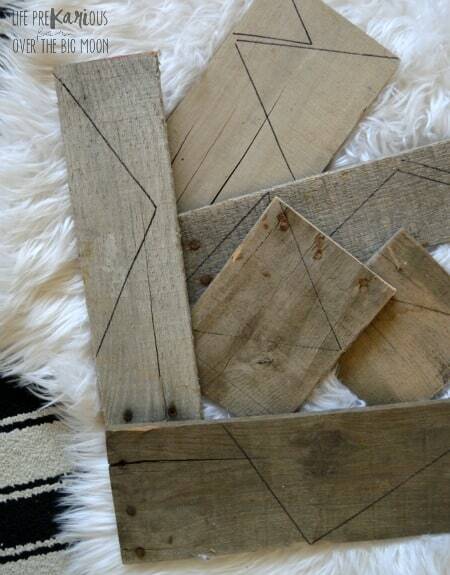 It’s so easy and is perfect for all those wood scraps you might have laying around. 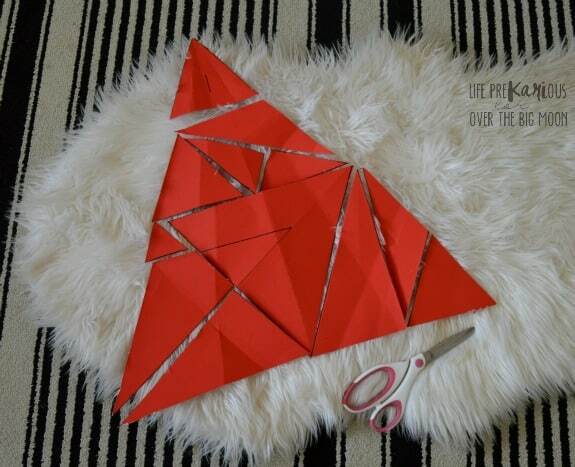 First, I cut a poster board into a large triangle then folded it randomly to make a bunch of smaller triangles. 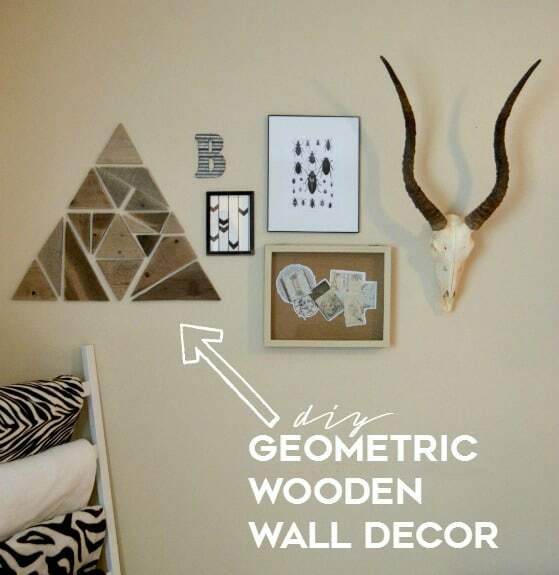 Once I was happy with the look, I cut the poster into the smaller triangles and used the pieces as stencils for my wood. I used pallet wood scraps that I had left over from previous projects. If you don’t have scrap wood laying around you could always buy a small sheet of wood from the hardware store and use different colors of stain to get the multicolored look. One fun trick I’ve used in the past is to use the same color of stain but dilute some of using mineral spirits it to get different shades of stain. I used a chop saw to cut all the pieces. I like the multicolored, rustic look so I left the pieces how they were and just sanded the edges a little so they weren’t so rough. I ended up not using all the stencils and switching it up a bit. 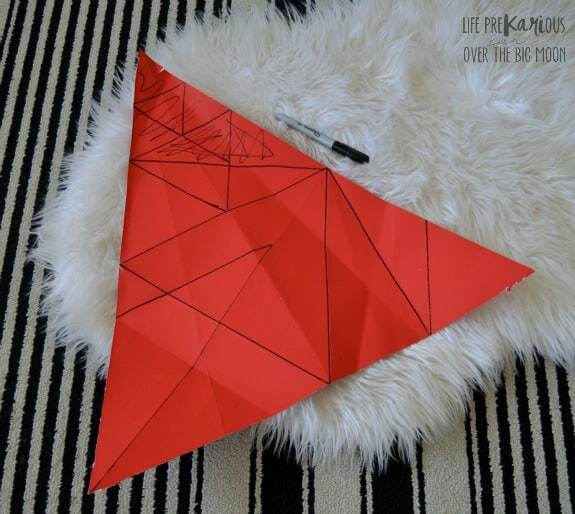 Once I started cutting the triangles and laying it all out it was easy to adjust to get the exact look I was going for. To hang them on the wall I used double-sided 3M tape. I’m working on a small gallery wall in my basement and this was the perfect addition! I hope you guys love this fun project!! I'm Kari. Saw wielding, usually covered in paint, wife of a hard-working, bearded ginger and mother of 4 (2 human, 2 canine). I’m impulsive. I’m messy. I’m unorganized and I’m horrible with time management. But… I’m creative. That’s my excuse. I have a deep-seated need to create things. I always have. Also, I like to party. I am a great fan of these projects. They’re simple but creative. I can’t wait to try this. Thanks for sharing. I like it. It’s clever and I always love the look of natural wood. Very unique. Oh my gosh! What a creative idea. I love it. What a fun idea! 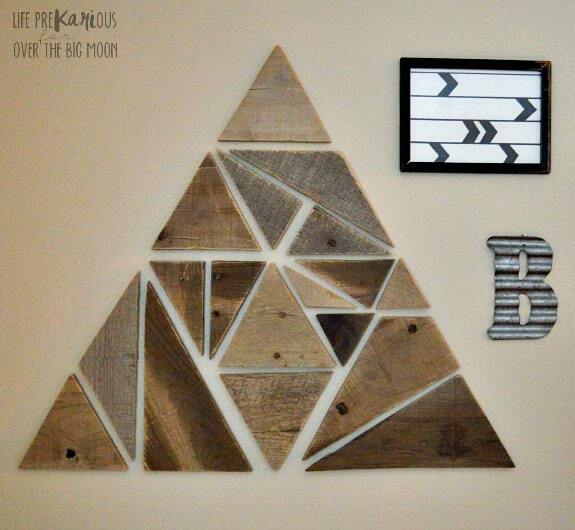 Great way to use some extra scrap pieces, too!